Extra! Extra! Read all about it! 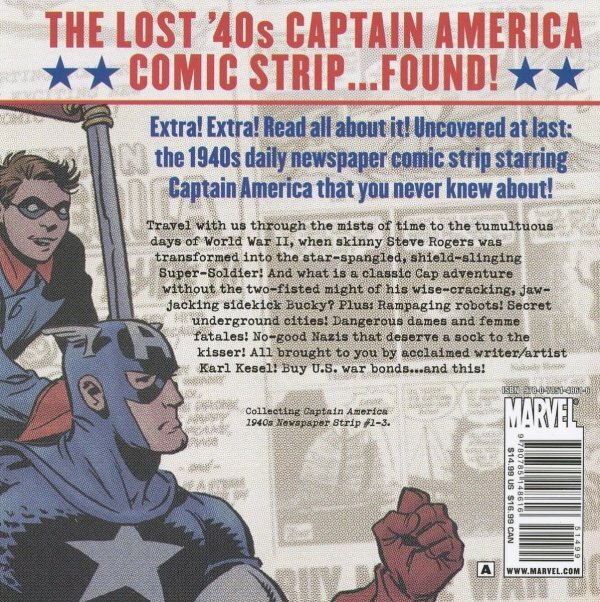 Uncovered at last: The 1940s daily newspaper comic strip starring Captain America that you never knew about! Travel with us through the mists of time to the tumultuous days of World War II, when skinny Steve Rogers was transformed into the star-spangled, shield-slinging Super-Soldier! And what is a classic Cap adventure without the two-fisted might of his wise-cracking, jaw-jacking sidekick Bucky? Plus: Rampaging robots! Secret underground cities! Dangerous dames and femme fatales! No-good Nazis that deserve a sock to the kisser! All brought to you by acclaimed writer/artist Karl Kesel! Buy U.S. war bonds?and this!